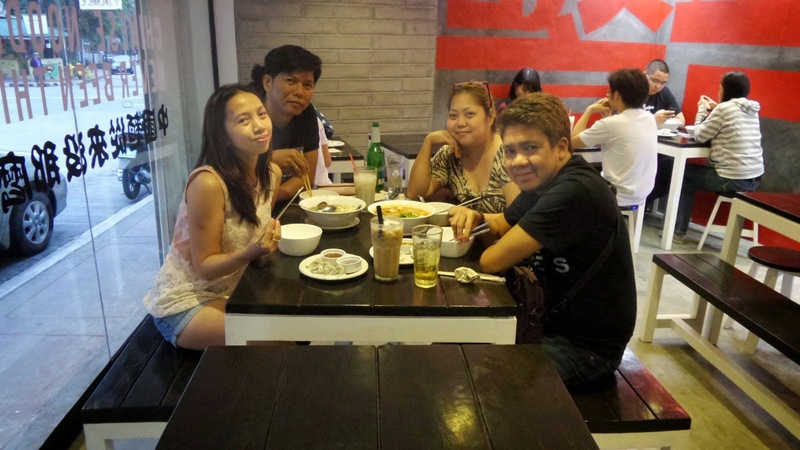 Magiting is actually located at the foodie haven vicinity known as Maginhawa. 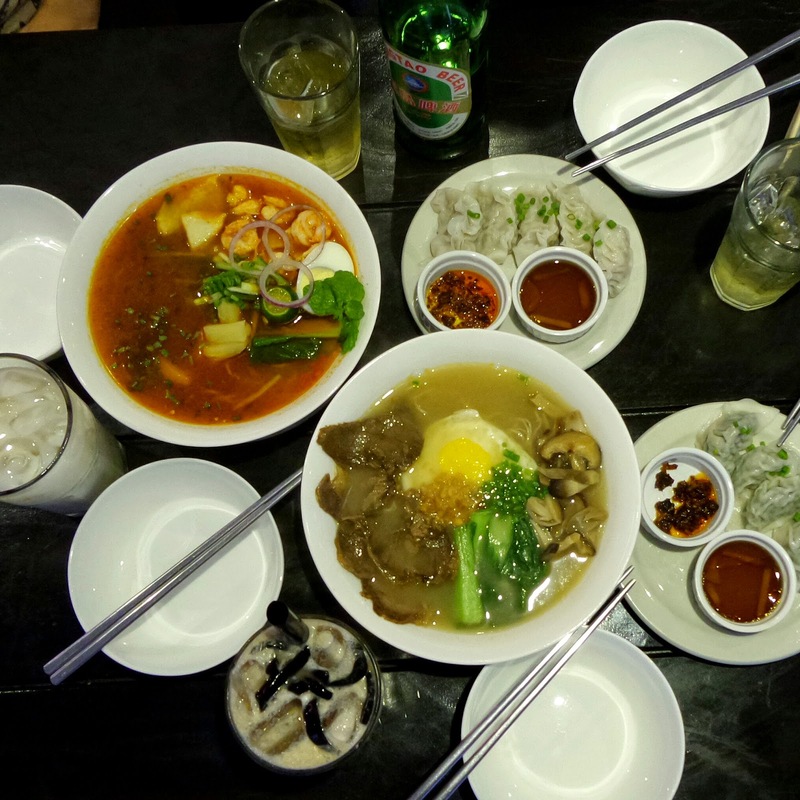 That's what I like about going to Maginhawa St., though a foodie coming from the south may see this as a hard challenge - with the traffic and mileage, however, discovering such a wonderful hole-in-the-wall is like finding a jewel in the desert. So, I came, armed with a hungry tummy and with a gang of spicy food conquerors. Bhogs, tagged along his sister and brother-in-law with us to help us check how this newbie can do some damages on our tongues. The photo above is a preview of how good the stuff are here. Everything is out of plain sight like the kitchen, cashier counters and even condiments. The moment you enter you instantly notice this huge wall-sized blackboard which is on the right side. It says all of the restaurant's intentions. Not to literally burn you though (duh! 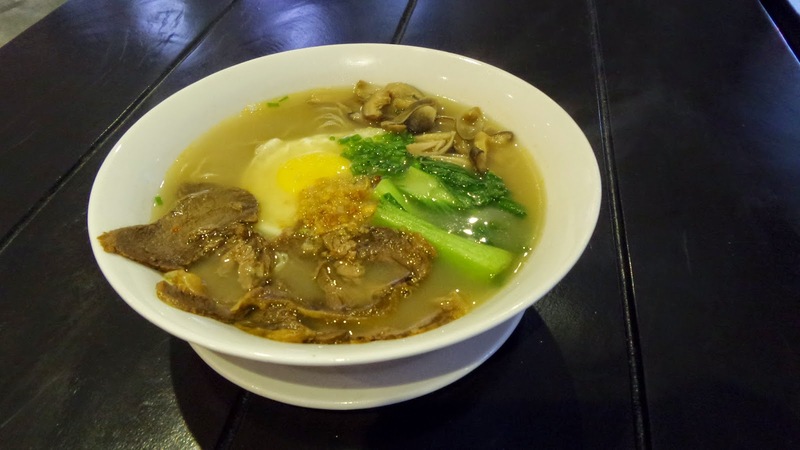 ), but to show that there is more to Chinese noodles than meets the eye. I like how this shop is so straight forward. Not too much frills on interior decorations but they did make sure the place is cozy and can work up your masculine appetite. 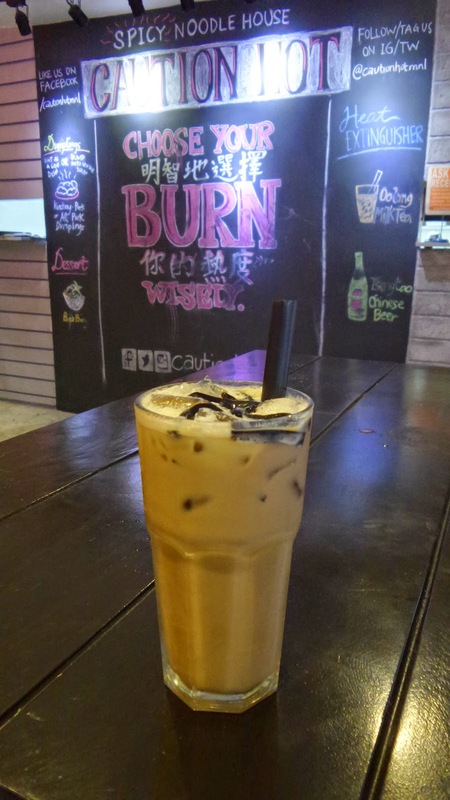 Upon seeing the beverage line, I was glad to see they have milk tea, so I got myself a cold glass of Oolong Milktea. It's freshly brewed oolong tea with a hint of wintermelon taste and milk, jazzed up with grass jelly. Bhogs got an unlimited serving of soya drink after having to find out from our waitstaff that's it the best spice buster. Even though I told him that milk and carbo rich foods does the trick as well. For my in-laws, they each had a bottle of Tsingtao beer. To begin our afternoon delight, we ordered two Pork-Kutchay Dumplings. 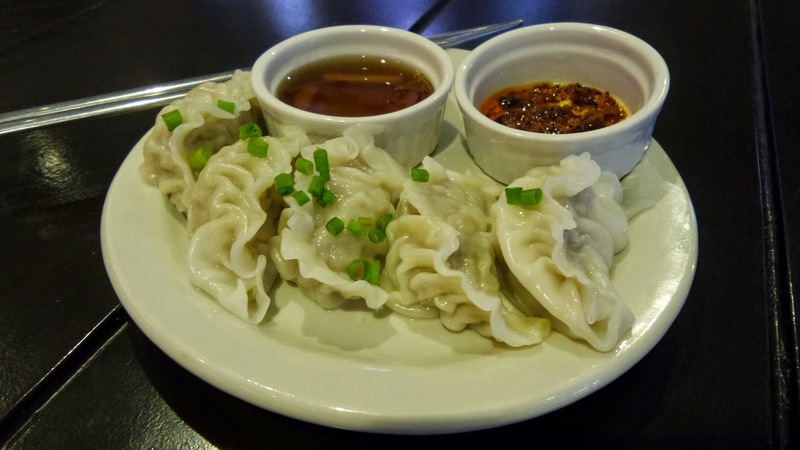 This silky-smooth dumplings are served with two dips - chili and fish sauce vinegar probably had dabs of ginger. We love that it's not totally veggie filled but has meat mixed in the filling. 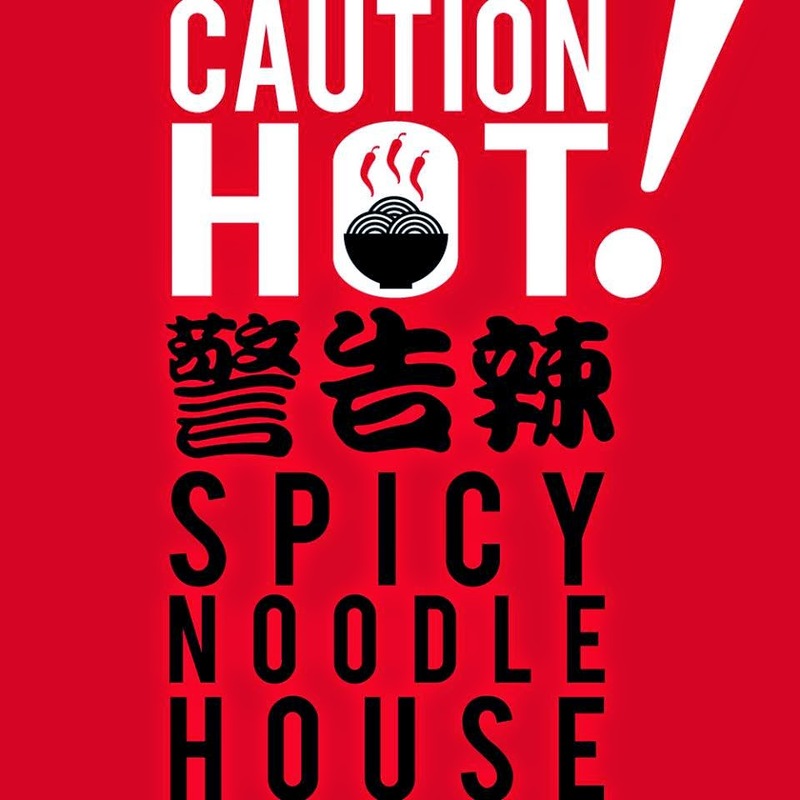 Now that we have decided how we want our Caution Hot! Noodles, though a question remains, if we are going to eat a bowl of it individually or order some and we all partake on it in sampling manners. 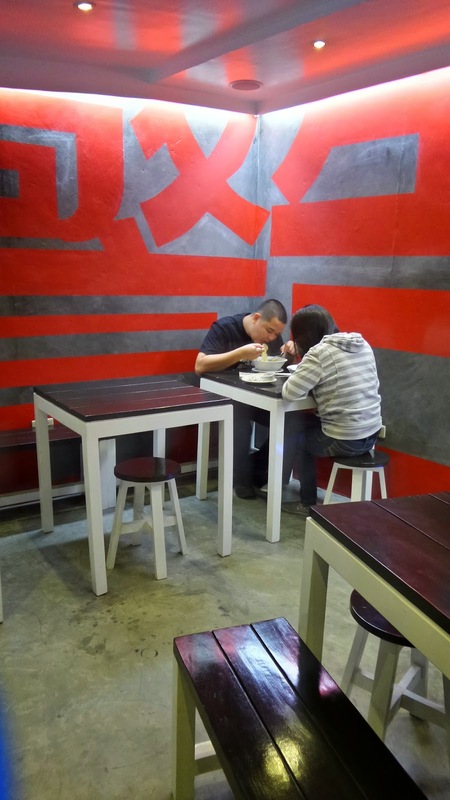 The guys ruled and ordered two differently styled noodles. The concept of DIY-ing your dish is not as unique but I must admit, this is a first on noodles. When you order. as suggested on the menu, you have to consider, first, the toppings, secondly, the kind of broth, third, the noodles and lastly, you have to choose your heat. Ok, let this serve as a warning: You have to choose your burn wisely! The levels of hotness are: First Degree Burn, Second Degree Burn, Third Degree Burn and Ultimate Burn. One after the other, the two Caution Hot! Noodles came and aroma wise, they are delectably appetizing! First to try is this: Beef + Szechuan + Wheat Noodles + Second Degree Burn. Schezuan broth is hot and sour typically of chicken soup base. Slightly thickened and adorned with bok choy, cilantro and mushrooms. The beef slices are from Taiwan and they are amazingly soft to the bite and with sweet after-bites while the sunny-side egg on top is also a delightful surprise as it adds a different texture to the dish. 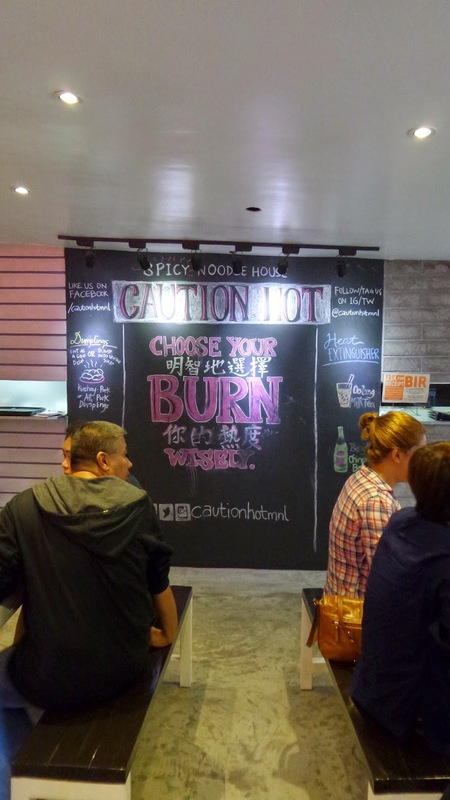 Next is the one designed by the other couple: Seafood + Asam Laksa + Egg Noodles + 3rd degree burn. I told them that the combination would be perfect as Asam Laksa is a fish broth with a complex taste. The spicy, sour, fruity and fragrant Penang Asam Laksa is traditionally made with poached, flaked mackerel, tamarind, chili, mint, lemongrass, onion, pineapple. 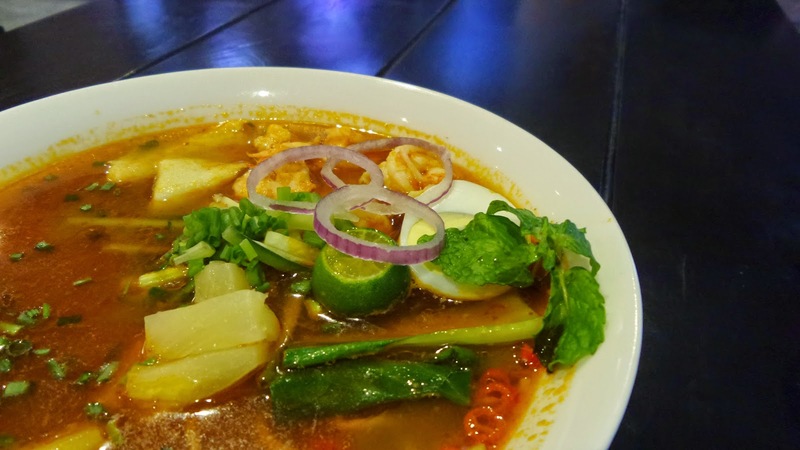 It's so addictive and apparently one of Malaysia’s most popular dishes "that’ll have your nose running before the spoon even hits your lips” was how the online lifestyle feature described Penang Asam Laksa. Don't let me choose which one I like better ok, for I loved both! 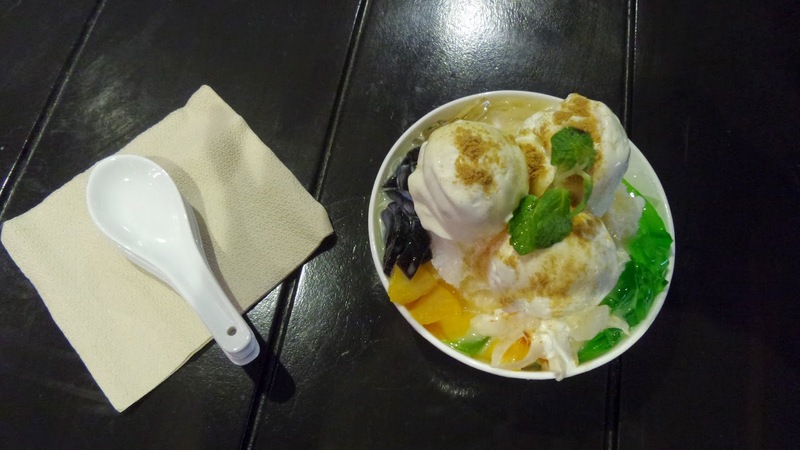 If you think this is a typical Halo-halo then you are mistaken. 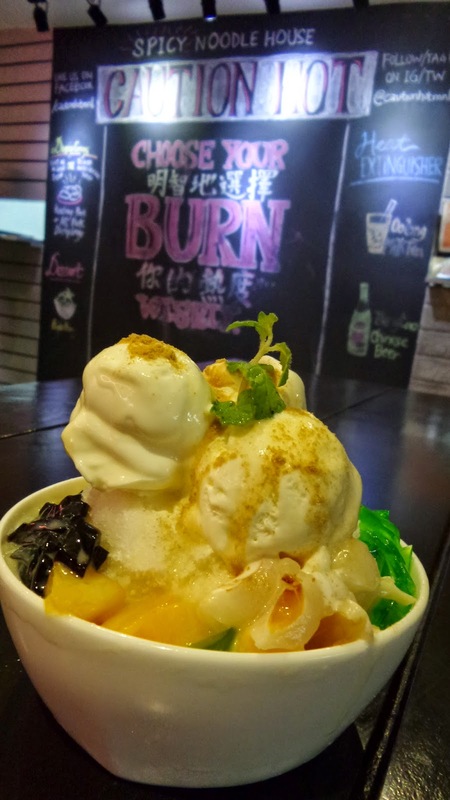 Bao Bing is a classic shaved ice dessert with fig and grass jelly, lychees and mangoes in condensed milk then graciously topped with vanilla ice cream. Now, this is the ultimate heal to our burn! If you are going to eat alone, better get someone to share this with, because this is very big for a dessert size. The travel was all worth it and the frugal persona of our group was so happy, the price where so affordable that we only spent less that P 800 for everything. 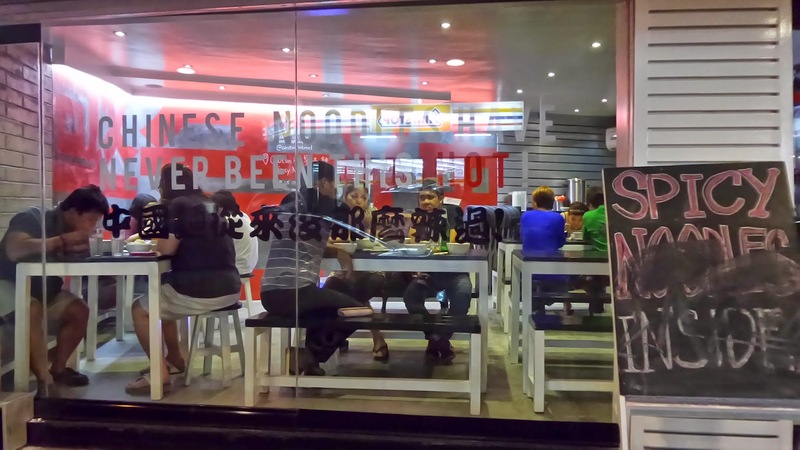 Plus taking to mind that serving is huge, well, with the fact that they literally serve the noodles in huge bowls, that two diners can share with it. Service was fast but you have to take note there are only less than ten tables available to seat everyone. This is perfect for my taste bud. I like everything hot/spicy! What a fantastic concept! This will surely satisfy people's craving for spicy and hot. I like the fact that you can tailor fit your order based on what you want and we're not just talking about the spice index but the type of meat, soup base, etc. Wow! yummy foodies. But I hate spicy foods. Still, a good place to feel one's tummy with Chinese dishes. Oh! the soup looks very delicious Sis. I need that to warm me up especially NY is very cold. What a fun times to spend with the family. indeed drooling with that soup you have there, i need some of those as it's good for a cold weather.